This playground, bounded by 25th Avenue, 98th Street, and 100th Street, stands in East Elmhurst, an historic neighborhood in northwestern Queens. Elmhurst was established in 1652 as Newtown, and originally covered the entire northwestern portion of Queens. The neighborhood was developed in the early 1890s, and renamed in 1896 by Cord Meyer, the owner of the Cord Meyer Development Company. Meyer hoped that the new name, Elmhurst, meaning “grove of elms,” would dissociate the neighborhood from Newtown Creek, a foul-smelling tributary of the East River that runs inland for three miles and serves as the boundary between Brooklyn and Queens. In 1934, Robert Moses (1888-1981) became Parks Commissioner, and launched a neighborhood playground development program unparalleled in the nation’s history. In 26 years, he acquired and built 777 playgrounds around the city, including this one. The land was acquired by the City of New York on February 15, 1956. In just six months, a play area was created with the standard playground equipment of the time: monkey bars, slides, and seesaws. The playground, which is jointly operated by Parks and the Board of Education, opened to the public on March 19, 1957, as part of the Aerospace Science Academy, Public School 127. In 1984, Mayor Edward I. Koch (b. 1924) sponsored a $496,000 rehabilitation of P.S. 127 Playground. Parks removed the 27-year-old equipment, and replaced it with timber-form play equipment, a renovated swing area, a comfort station, a safety-surfaced spray area, a baseball field, and basketball and handball courts. 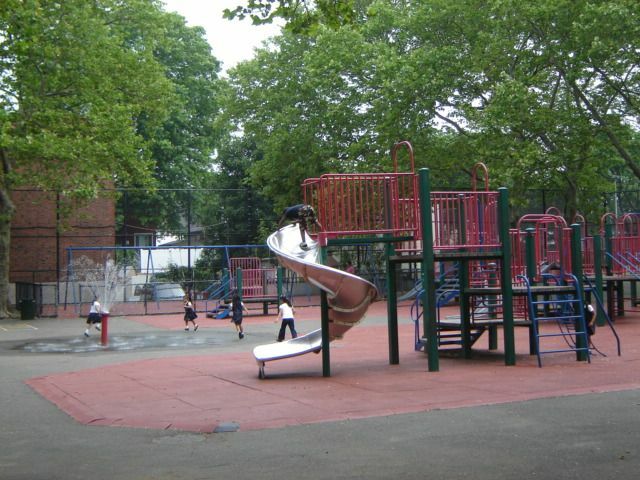 Parks has since renamed the park East Elmhurst Playground, and continues to maintain it. 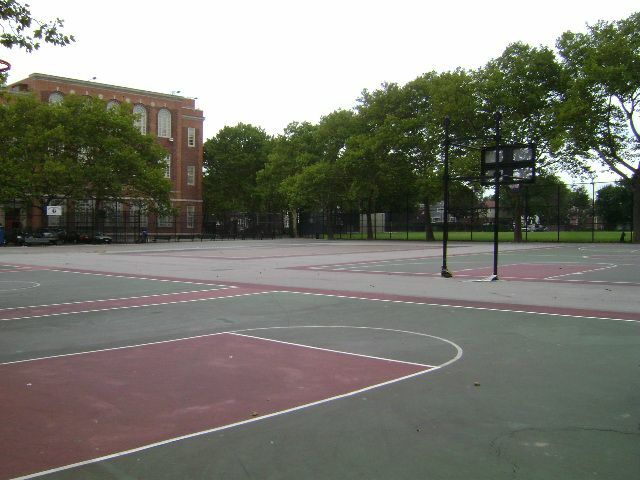 In 1994, City Council Member Helen M. Marshall sponsored a $352,176 reconstruction of the play equipment and, in 1995, a $245,257 reconstruction of the ballfields. Today, East Elmhurst Playground still adjoins P.S. 127, providing the community a welcome place for rest and relaxation. At the center of the park, a flagpole and yardarm display the flags of the United States, the City of New York, and Parks & Recreation.